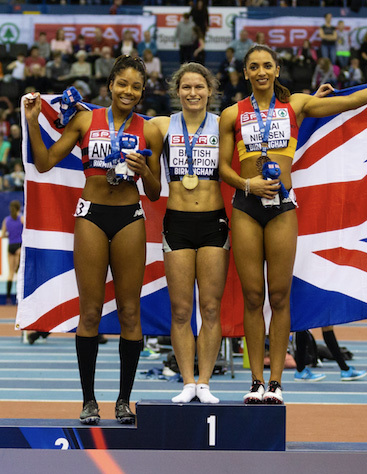 Amber Anning broke the 49 year old British under-20 women’s 400m indoor record and bagged a totally unexpected silver medal at the Senior British Athletics Championships and European Indoor trials. Her time of 53 seconds is the fastest ever by a British woman under 20. She was the youngest athlete to make the final and not expected to feature as a medallist, but ran a great race and snuck in on the inside in the final 5 metres. Amber has automatic selection to represent Team GB in the European Indoor Championships in Glasgow. Amber Anning on the podium with winner Zoey Clark and bronze medallist Laviai Neilson.